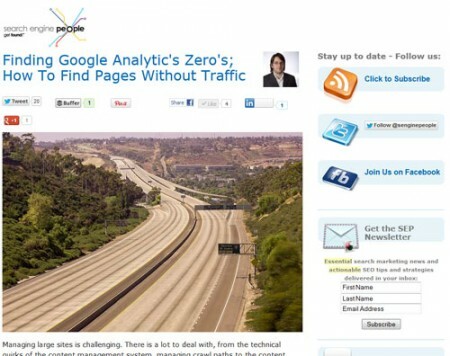 Most tools have their own limitations, and one of Google Analytic’s blind spots are pages with no traffic at all. Google Analytics tracks visitors and not pages, which if used as the only tool for monitoring site performance can lead the user to ignore certain parts of the site. Managing large sites is challenging. There is a lot to deal with, from the technical quirks of the content management system, managing crawl paths to the content you want to promote, without overly enthusiastic use of nofollow/noindex. Read more of “Finding Google Analytic’s Zero’s; How To Find Pages Without Traffic“.